Looking downriver from below Iowa Drive. I have multiple myeloma, a blood cancer of plasma cells. I’ve managed things well but the jinx of my chirpy posts about good cancer fortune had heard enough. Recently, the myeloma aimed its rheumy stinkeye my way … then blinked. My immune system wilted and a nasty chest cold skewered me to the wall of agony for seven weeks. I got sick; I got better; it took a long time; and I didn’t post. I’ve been wellish for two weeks following a succession of low grade fevers, a persistent rib rattling cough, and other discomforts. I lost 15 pounds. I considered trips to the ER. I tried to walk it off. I tried to sleep it off. Then I tried to drug it off. Finally, I just lived longer than the damn thing. So … success. My son’s dog, Bruce, above the river canyon. Now, I am back to writing. I’ve finished another portion of Southwood, A Memoir. Two more pieces of the pie (I think) to go. It wrankles me; it pleases me. But it takes energy, a lot of energy and I’m certifiably anemic. Time and place, truth and lies, insight and forgiveness: memoir is messy fun. My favorite diversion is hanging out with my granddaughter, Savannah. Yesterday, her dad and I went for a short riverwalk near their upper valley home. A late spring heat wave emerged from the roiling ocean of windy weather that had battered kite sailors last week. The prevailing westerlies fled over the horizon, taking with them all the clouds. A little snack in the sunshine with Dad. In town, the Columbia River laid flat in the doldrums and a swelter of heat shimmered above the valley’s lush vegetation. 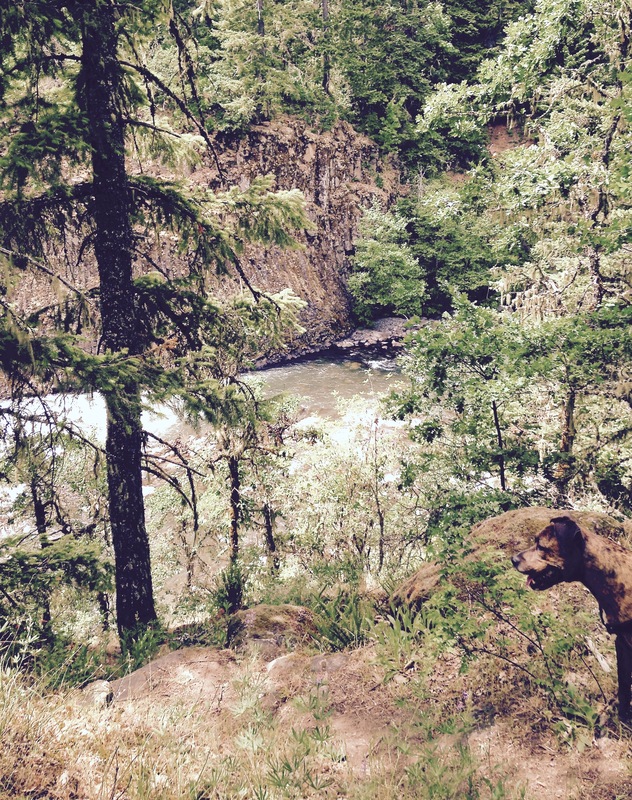 We found relief amidst a shaded trail along the main fork of the Hood River. Savvy rode in a backpack atop dad’s shoulders. She surveyed the dense undergrowth in a forest of fir and maple and pine. I walked ahead with Bruce, my son’s brindle pit bull mix. 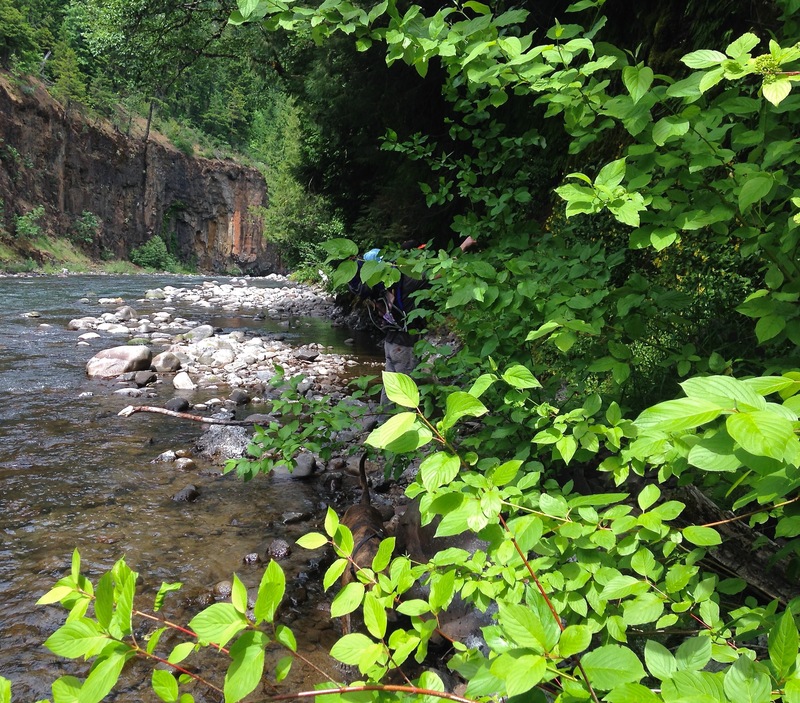 The path follows a cliff’s edge, then descends to a boulder strewn river bed. 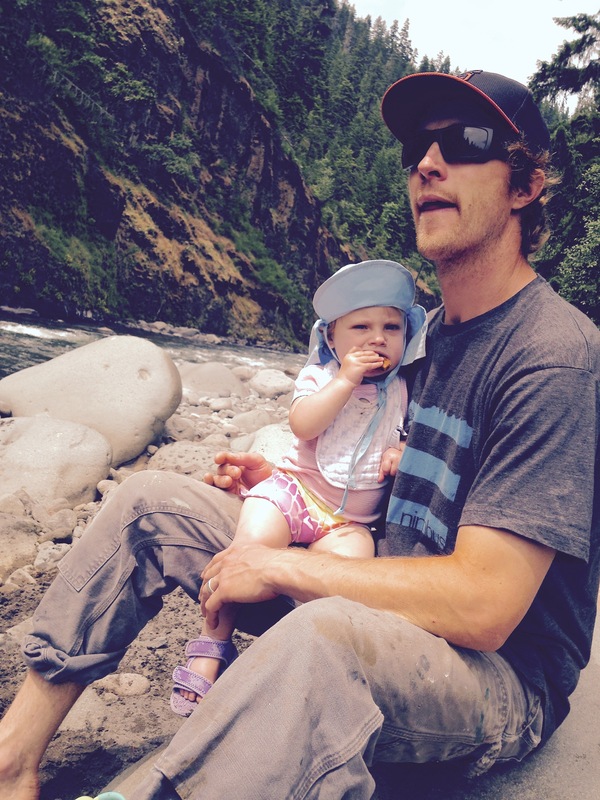 We rested in the sun and Savvy pattered in a rocky pool and nibbled on fig bars. The water’s brisk current reverberated off the basalt cliffs, it’s white noise interrupted only by the sawing of a merganser’s wings and the chitters of cliff dwelling swallows. 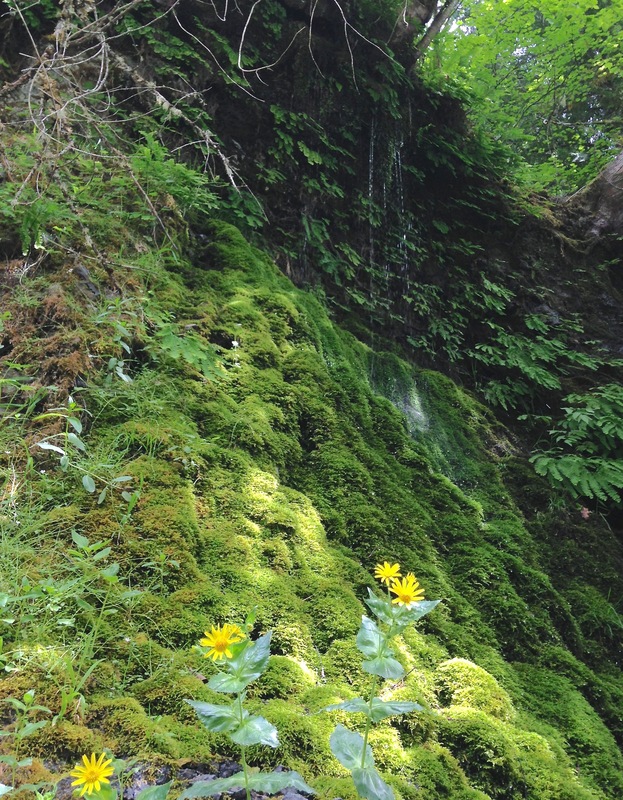 A cliff feature of water, sun, moss, and flowers. Bruce chased lizards sunning themselves on the rocks. They scampered into burrows among the boulders. He thrust his snout deep into the shadows and huffed with frustration. Then he forgot them and frolicked through the shallows, lapping up river water. We departed. Bruce tugged on his leash and helped pull me up the trail out of the canyon. Back on the level path, we four headed home. The forest swallowed the river sounds, a lone bird sang and Savvy hummed along to the rhythm of our footfalls. Beautifully painted picture. So glad you’re finally feeling better. Glad you are doing better. I had similar crud, but fever was only 5 days, cough for a couple of weeks and had to delay chemo for a couple of days. Numbers didn’t look good, but they have bounced back, too. Just like us! Good to hear that you’re feeling better and are back to work on the memoir. “Messy fun” is an apt description of the process. Your photos are wonderful. What a blissful day that must have been. When you write, prose becomes poetry, especially with this entry. So sorry for the pain you have been enduring. So happy for you to have had this beautiful day and for sharing it. Its difficult to find the words to describe such eloquence John. I found myself breathing a deep sigh and sensed a warm presence as I read on. So glad to find you writing again! You create such wonderfully vivid vignettes. I’m happy for you and your family. Congratulations on your granddaughter! This is just great…in the background while I was reading this was a great version of Hallelujah, and both words and music had a great cadence with each other. Wishing you the very best John and loved the photos with this post as well. Cheers to you.